Burgers choices factor heavily into this game’s story. Well, I went and made another game. It took a bit longer than I expected for a “I bet I can whip this off in a weekend”-project, but I think I’m finally ready to call this thing finished. It’s called “Save the Date“, and in a stark departure from what I usually write (weird deconstructions and variants on shmups) it is instead a weird… dating sim. About having dinner. I don’t really have any good way to describe what sorts of mental processes lead someone to up and write a dating sim out of the blue. All I can say is, it seemed like a neat idea, and something that would be pretty quick to throw together. And at least ONE of those two things proved to be true. Also, I feel like I should give a shout-out to the fine folk behind Ren’Py, which really does an amazing job of zooming in on the things that you want to do, and focusing on making them easy, with laser-like precision. I can’t promise that this is a genre that I plan to do a lot more with, but if I do, I will almost certainly be using Ren’Py again. So anyway, go try it. Play it. If you feel verbose, you can even tell me what you think of it. It’s pretty different from the sorts of things I usually write, but on the balance, I’m pretty happy with how it came out. It’s probably about 45-90 minutes of your time, and who knows. 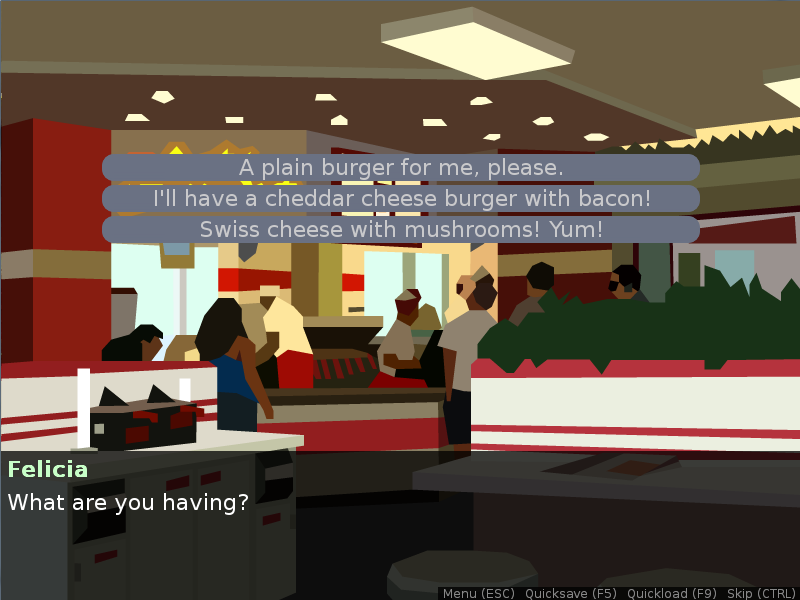 It might just be a better dinner-themed dating sim than you might expect! At the very least, I can promise that it is probably a different one than you expect. This entry was posted in Games, Save the Date. Bookmark the permalink. Follow any comments here with the RSS feed for this post. Post a comment or leave a trackback: Trackback URL.